Haha, what can I say? It’s another cross-dressing idol story! I know! So many of them! It’s not like I deliberately go looking for them, really! I just sort of end up buying them at random somehow! 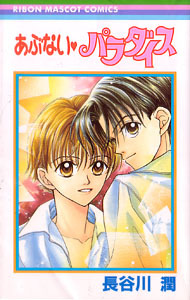 Actually, when I saw this cover, I was hoping for some rare boys love in a Ribon Mascot Comics series (seemed unlikely!) but it turns out that one of those guys is a girl 🙂 This is a cute one-shot volume where the main story takes up the entire book, and includes a little bonus story about the main characters again at the end. The art style is a but messy, but cute, and has a very late 90’s feel to it. I need to make sections of this site that talk about 80’s shoujo manga art and 90’s shoujo manga art, because there are some definite characteristics to it as trends change over the years. One random thing that amused me about this book is that it is set in the entertainment world, so there is one single panle towards the end of the book where, in the background, you see Sana-chan and her manager, Rei-kun from Kodocha walking by 🙂 Awesome! Anyway, our heroine is a very boyish-looking girl named SUEHIRO Yuki. She has very short hair, and a boyish face, so all the girls at her school idolize her as if she were a boy. Poor Yuki really loves girly things (her bedroom at home looks like a dollhouse exploded in it, it’s all ruffles and frills) but she is stuck growing up with a very, VERY macho bodybuilder dad, and a macho mom, so it has been hard to maintain her feminine behavior and looks when all they want to do is train her and act all tough around her. Yuki clings to girly things, and, like most girls her age, she has a crush on a popular idol singer. His name is Kazuki, and Yuki has a large poster of him up on her wall that she likes to talk and confess her love. Fortunately for Yuki, she may not have to make do with just a poster, she may get to meet the real thing! She receives a call about a talent audition she can try out for. It’s a new commercial that Kazuki is doing! But the thing is, they need a very pretty girl for the part. Yuki’s friend does her best to help her look more feminine, and with the help of a frilly dress and a wig, Yuki does her best at the auditions. Things are a little awkward, but not awful until the hair of the wig gets caught on a chair and the wig comes off! Everyone immediately jumps to the conclusion that Yuki is a boy in drag, trying out for the commercial, and she is thrown out! They don’t believe her when she says she is a girl! Aw, poor Yuki. Ah, but wait! As there always is in these types of series, one eccentric company president happens to have attended the audition, and he takes a liking to Yuki. He has a great idea! He pretty much kidnaps Yuki and takes her to his company, where he explains that he thinks she is very interesting, and he wants her to become a boy idol! Yuki explains that she really is a girl, but he doesn’t care. From now on, she will g by the name of SUE Hiroyuki. Just moving one syllable from the end of her last name over to her first name makes all the difference. Yuki is now Hiroyuki! But why should Yuki agree to this? Well, the boss wants her to become part of an idol unit with none other than Kazuki! How could Yuki pass up the opportunity to work with her idol, Kazuki!? Apparently, Kazuki has been in show business for a while, and he is pretty lonely. He really wants a male friend he can depend on to keep him company. Not some girl who will be bothersome. And, er, Kazuki actually has a weird allergy to girls. When he is around them, he breaks out in hives. When Yuki meets him, he has no idea she is a girl, so he appears to be fine. The two actually hit it off, and are soon good friends. Yuki feels really weird, pretending to be a guy, and hiding her true identity from Kazuki, but she is learning a lot and working hard. When Yuki feels freaked out or uncomfortable, Kazuki coaches her, and together they make some good commercials, and eventually even become an idol singing group called “Hiro’s”. You see, Kazuki’s name is actually KAZUKI Takahiro, and Yuki is going by SUE Hiroyuki, so they both have “Hiro” in their names. Cute play on words there, though the English is questionable 🙂 As a part of “Hiro’s” Yuki sings, dances, and acts alongside Kazuki. She even gains a fan following of her own! Ah, but Kazuki has been popular for a while, and has some devoted fans both in and out of show business. Poor Yuki must juggle the stress of acting like a boy, being around Kazuki while hiding her identity, learning showbusiness, and dealing with jealous rivals. There are people who would like to separate her from Kazuki. Will they succeed? What would happen if Kazuki found out? What would happen if the world found out? heeeeey .. okay i am so sorry for this question but i was just wondering from were do you buy the mangas? btw i adore the mangas which have cross dressing in them kinda complecated but cool/fun to read!! I buy my manga from my local Kinokuniya bookstores, or when I visit the Los Angeles area, I go to the Book-Off used manga bookstores and get it there. I have also bought manga online from places like BK1 (http://www.bk1.co.jp) or Amazon Japan.